Marbles Game, a fun and simple variation of the famous Chinese Checkers Game! Try to remove all but one marble from the board. You can remove a marble by skipping over it to an empty spot. Select a marble by clicking on it and move it by selecting the spot that you want to move to. REPORT  ZTEST_NP_MARBLE NO STANDARD PAGE HEADING. DATA: IT_SCORE TYPE STANDARD TABLE OF TY_SCORE. ICON_2(40) TYPE C VALUE ICON_COLOR. *           ICON_2(40) TYPE C VALUE ICON_COLOR. PARAMETERS: P_NUM TYPE I DEFAULT 7. * A T   S E L E C T I O N - S C R E E N .
MESSAGE E398(00) WITH 'Currently allowed only: 5, 7, 9'. L_MOD = P_NUM MOD 2. MESSAGE E398(00) WITH 'Only odd numbers are allowed'. L_HALF = FLOOR( P_NUM / 2 ). L_HALF_HALF = L_HALF / 2. R_NOT_GREY-LOW  = ( L_HALF - L_HALF_HALF ) + 1. R_NOT_GREY-HIGH = ( L_HALF + L_HALF_HALF ) - 1. CONCATENATE 'WA_ITAB-C' L_NO_C INTO L_NAME. W_TOTAL = W_TOTAL - 1. W_TOTAL = W_TOTAL + 1. *       Convert ITAB value to PRINT table value . LOOP AT ITAB INTO WA_ITAB. CONCATENATE 'WA_PRINT-C' L_NO_C INTO L_NAME. LOOP AT IT_PRINT INTO WA_PRINT. IF NOT <F1> IS INITIAL. WRITE: (2) <F1> AS ICON HOTSPOT ON, (2) ' '. WRITE: (2) ' ', (2) ' '. 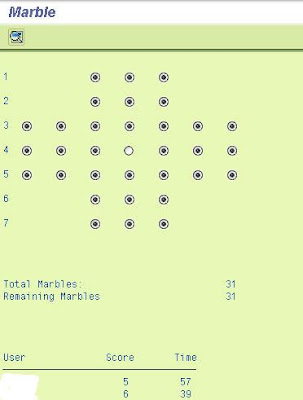 WRITE: /(30) 'Total Marbles:',    W_TOTAL. WRITE: /(30) 'Remaining Marbles', W_REM. READ TABLE ITAB INTO WA_ITAB INDEX W_LINE. REPLACE 'PRINT' INTO L_SEL_FIELD WITH 'ITAB'. MESSAGE S398(00) WITH 'No marble to select.!'. L_TMP_COL = L_SEL_COL + 2. CONCATENATE 'WA_ITAB-C' L_TMP_COL INTO L_TMP_FIELD. L_TMP_COL = L_SEL_COL - 2. L_TMP_LINE = W_LINE - 2. READ TABLE ITAB INTO WA_ITAB INDEX L_TMP_LINE. L_TMP_LINE = W_LINE + 2. MODIFY ITAB FROM WA_ITAB INDEX W_LINE. MESSAGE S398(00) WITH 'No marble to select.!' ' ' ' ' ' '. MESSAGE S398(00) WITH 'Marble was deselected..!!'. READ TABLE ITAB INTO L_ITAB_DEST INDEX W_LINE. REPLACE 'WA_PRINT' INTO L_DEST_FIELD WITH 'L_ITAB_DEST'. L_TMP_LINE = ABS( W_SEL_LINE - W_LINE ). L_TMP_COL = ABS( W_SEL_COL - L_DEST_COL ). MESSAGE S398(00) WITH 'Destination is not GOOD' ' ' ' ' ' '. L_TMP_COL = W_DEST_COL + 1. L_TMP_COL = W_SEL_COL + 1. READ TABLE ITAB INTO L_ITAB INDEX W_SEL_LINE. REPLACE 'WA_PRINT' INTO L_FIELD WITH 'L_ITAB'. W_GONE = W_GONE + 1. MODIFY ITAB FROM L_ITAB INDEX W_SEL_LINE. L_TMP_LINE = W_DEST_LINE + 1. L_TMP_LINE = W_SEL_LINE + 1. READ TABLE ITAB INTO L_ITAB INDEX L_TMP_LINE. MODIFY ITAB FROM L_ITAB INDEX L_TMP_LINE. READ TABLE ITAB INTO L_ITAB INDEX W_DEST_LINE. MODIFY ITAB FROM L_ITAB INDEX W_DEST_LINE. *   Make Selected = 0. W_REM = W_TOTAL - W_GONE. L_TOT_HALF = ABS( W_TOTAL / 2 ). LOOP AT ITAB INTO L_ITAB. CONCATENATE 'L_ITAB-C' L_NO_C INTO L_NAME. *      IF <F1> = '1'. L_TMP_COL = L_SEL_COL + 1. CONCATENATE 'L_ITAB-C' L_TMP_COL INTO L_TMP_FIELD. L_TMP_COL = L_SEL_COL - 1. CONCATENATE 'L_ITAB-C' L_NO_C INTO L_TMP_FIELD. L_TMP_LINE = L_LINE - 1. L_TMP_LINE = L_LINE - 2. L_TMP_LINE = L_LINE + 1. L_TMP_LINE = L_LINE + 2. MESSAGE S398(00) WITH 'Game Over. Socre:' W_REM. L_TIME = W_END_TIME - W_ST_TIME. SORT IT_SCORE BY SCORE TIME. LOOP AT IT_SCORE INTO W_SCORE. DELETE IT_SCORE WHERE SRL > 5. Congrats for the good score. Keep it up. This is the best code I have ever seen in Abap era. Fun to play, thank you for sharing.